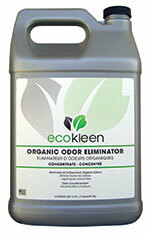 Ecokleen Organic Odor Eliminator will eliminate organic odors on environmental surfaces. Not simply a “masking agent”, ecokleen Odor Eliminators are specifically formulated to counteract the mal odors trapped in paint and other room surfaces. It can be applied in many ways; pump spray, fogger, and by mop. Note: Store in cool location.